Last year we wrote about research published by American cardiologists in the JAMA Network Open. According to that research, fit people were able to further reduce their mortality risk - read: make their expected lifespan even longer - just by getting fitter. The same research also shows that being fit is just as bad for your health as not smoking. The researchers used the data from just over 120,000 patients whose physicians had determined their fitness between 1991 and 2014 with an exercise test, and divided the patients into 5 groups based on their fitness. Then they had tracked whether the patients died. Of course, increased smoking increased the risk of death. Smoking was a risk factor of the same magnitude as diabetes, high blood pressure and cardiovascular disease [CAD], but not as large as end-stage renal disease. As a risk factor, smoking turned out to be the same size as a low fitness level. In fact, the difference between the probability of death of the study participants with the worst cardiorespiratory fitness levels and that of the participans with elite fitness levels [Low vs Elite] was greater than the difference between the probability of death of smokers and that of non-smokers. The figure above is simplified. Click on it for an integral version. Just like other forms of physical exercise, walking is healthy. That's why walkers live longer than people with a sedentary lifestyle. 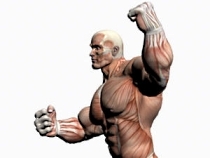 Moreover, your muscles partly determine the ability of your body to withstand life-extending chemotherapy, write American oncologists in Clinical Cancer Research.